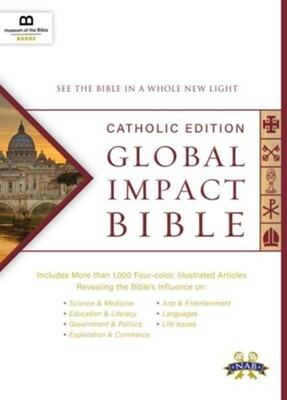 The NABRE Global Impact Bible, Catholic Edition is one of the most comprehensive resources for exploring the deep impact, historical significance, and global influence of the Bible- the best-selling book of all time. This 4-color, highly illustrated Bible illuminates and enlivens the Bible as powerful living text. Inspirational and reader-friendly, the Global Impact Bible sheds light on the many amazing ways that the Bible has influenced our lives and our world. Uses the New American Bible, Revised Edition (NABRE) translation. Includes the Apocrypha. The Museum of the Bible opened it's 40-foot bronze entry doors in Washington, D.C. in November 2017 and marked an unprecedented historical first in Bible history. The one-of-a-kind collection is housed in a 430,000-square-foot building just two blocks from the National Mall and three blocks from the nation's Capitol. The largest single museum in Washington D.C., and the first in the world to focus on honoring the Bible, the Museum provides guests with an immersive and personalized experience as they explore the history, narrative, and global impact of the Bible. Worthy Publishing Group and Museum of the Bible have teamed up to form a new book-publishing imprint, Museum of the Bible Books. I'm the author/artist and I want to review Global Impact Bible, NABRE Catholic Edition, Hardcover.